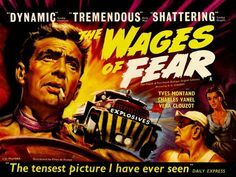 The Wages of Fear is an interesting film and very good, but is it a classic film noir? While watching this I was on the fence and looked for other people’s opinion on the matter. Wikipedia and AMC do not list it in their full list of film noir titles. The Film Noir Foundation does, and John Grant has it in his “A Comprehensive Encyclopedia of Film Noir.” If you don’t know about John Grant check out his blog at https://noirencyclopedia.wordpress.com/ for a ton of noir information. My argument for it not being a film noir is there really isn’t anything illegal going on here, sure our big American oil company is immoral and all about the mighty dollar. Sure some of the things they did in this film would be illegal today, but in the 1950’s it was probably all legit. There is no femme fatale to speak of, Vera Clouzot is almost the anti-femme fatale. All she cares about is the safety of her main man. 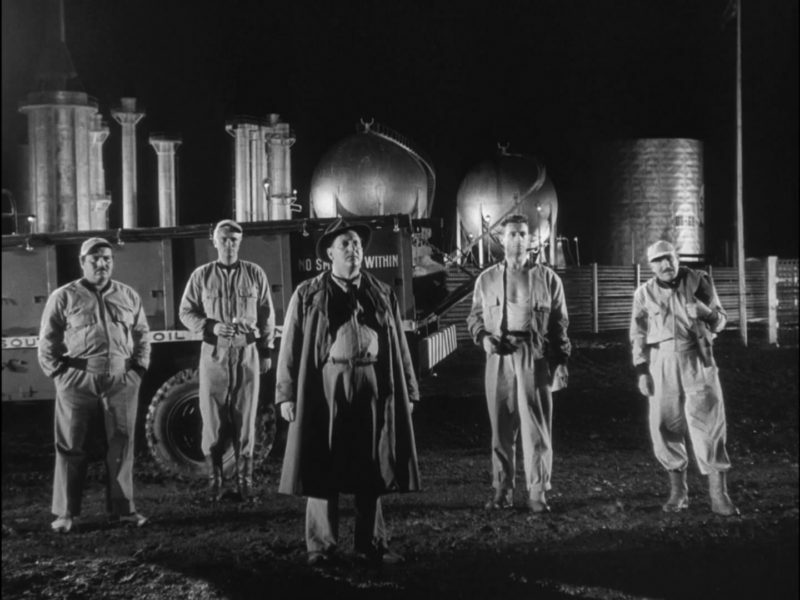 The shooting of the film is not in the classic noir style except in a few key scenes. Hardly any shadow play is used, being most of the film takes place in the middle of the day in the desert. My argument for it being a noir story is quite simple, a handful of characters are put in a situation they have very little hope of getting out of. When they see their chance, they take it, even though they know their chances are slim to none. They will almost do anything in their means for a little hope. They are average men put in an extreme circumstance like all good noirs. The end isn’t exactly a happy one either, another trademark of a good noir. This movie is based on the book by Georges Arnaud and is adapted for the screen and directed by Henri-Georges Clouzot. It stars Yves Montand as our main hero, Mario. This is Montand’s first dramatic role and what a role! He went on to make many great films and I look forward to watching more of his work. This story starts with Mario and some other ex-pats in a small bar in an unknown village. We see Linda, Vera Clouzot’s character, washing the bar floor and soon crawls over and purrs like a cat as Mario pets her. A very interesting scene as we get an idea of Linda’s situation. A new man flies into town on the plane by the name of Jo, played by Charles Vanel. We soon find out how it is cheap to get to this village but there is no work and it is very expensive to get out. We have a small group of guys stuck in the village, scraping by on odd jobs, just enough to get a meal and a drink at the bar on a good day. The opportunity arises when the big oil company has a oil well blow up and they need some nitroglycerin shipped over 300 miles to the site to extinguish the well. Knowing the unions would never send any of their own men to do the task, they get the group to compete for one of 4 spots on driving 2 trucks to the site. Knowing they have a 50% chance of making it, do to the lack of the right equipment and the nature of the nitroglycerin, 1 of the 2 trucks should make it. This only gets darker and more intense from here. After watching this, you can see why America edited out over 50 minutes of footage so they would not look to bad. The greed of the big corporation is nothing new, but it is interesting to see this from a French prospective. This movie is an amazing movie, every film buff should see it least once, but is it a film noir? What do you think? Favorite Tidbit: Vera Clouzot only appeared in 3 films, all directed by her husband Henri-Georges Clouzot. One of her other two films is Diabolique. Not a bad hitting percentage. One way of looking at the conundrum is this: had that exact same movie been made but in the US by Fritz Lang and starring Edward G. Robinson, would we even be asking the question? My cousin is telling me that when they sold it to the US the told the french to reshoot the ending because it was no a happy ending so they did. In the french version threes no happy ending. Later on the US did go back with the original ending. Great film love this one I have it in my collection. Best to see this film with a glass of wine. nice review of my favorite.